Komen campaign for MBC: Commitment? We all have a story to tell and we can be inspired in writing the story and in reading others’ stories. 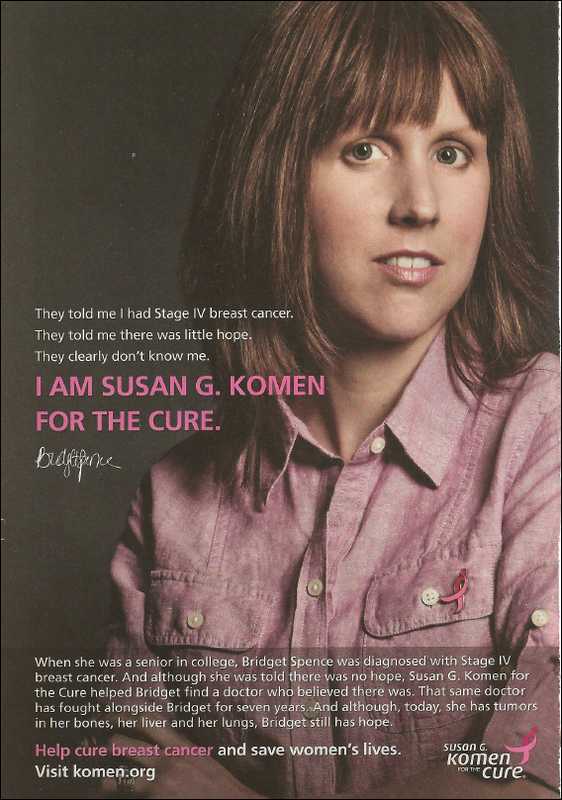 Our organization actively solicits stories such as those of Cindy and Bridget, the two people featured in this Komen ad. Some stories are inspiring, as those of Cindy and Bridget; however, many stories are of perseverance in the face of uncertainty and discomfort. Like Cindy, I love to read stories by people who are living with metastatic disease for a long time–MBCN even has a special section showcasing the stories of those living with mets for 10 or more years. (See http://mbcn.org/get-involved/category/10-years/) But it is an awfully small section– living with MBC for 20 years or even 10 years is rare. While I applaud these uplifting stories, I am a realist at heart. We can’t exaggerate the progress that’s been made in metastatic disease. Despite these outliers and despite our own advocacy efforts, metastatic breast cancer continues to claim 40,000 lives annually in the U.S.; a figure that remains largely unchanged for the past two decades. And then there’s Komen’s commitment to research. Komen proudly announces that they spent $35 million in funding metastatic research over the last six years. That’s great! Millions! Well, wait a minute. This is $35 milllion vs. the $2 billion of the total Komen pie for the last six years. (That’s not a typo: “Billion” is correct.) Therefore, Komen is spending 1.7% ( round it up to 2%) of the total funds raised for the purpose of metastatic research. So for every $10,000 raised by Komen, about $200 goes to research to help Cindy and Bridget and all of us with metastatic disease. In other words, if breast cancer funding were a giant Monopoly board, we are the “Go” square. Everytime Komen passes our corner with $10,000, MBC research collects $200. Well, $200 is nothing to sneeze at, but we’ll never win if we don’t get some real property. Please don’t keep passing us by. Stay awhile–make some real MBC investments. Imagine what we could do if we had the research equivalent of three hotels on Illinois Avenue! 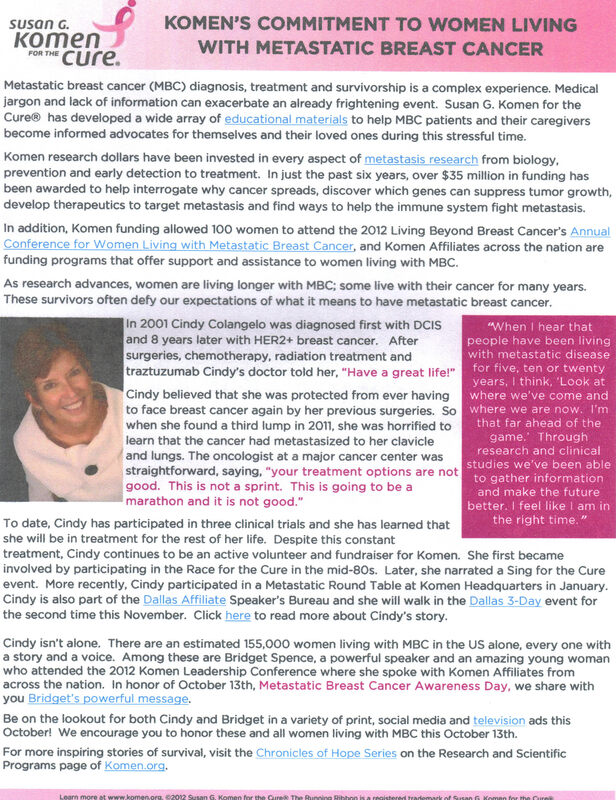 So thank you, Komen, for including our stories and acknowledging October 13 as Metastatic Breast Cancer Awareness Day. It’s a good start, but we hope it’s just the first step in a plan to really commit to stopping metastases. The best way to honor all of us with MBC and those who are no longer with us, is to seize the day–October 13– as an opportunity to commit to a substantial increase in metastatic research funding. Komen, are you listening? We look forward to your October 13 press release. By Laura Wells, Stage IV Metastatic Breast Cancer Fighter, written in honor of the women who are fighting and the women we are losing. When I was first diagnosed with breast cancer, I found it hard to embrace the “Pink Ribbon” and all it stood for. I was not happy to be joining the club, but I was also uncomfortable with becoming an instant advocate for a cause, simply because I would now benefit from it. It seemed selfish and hypocritical. I learned that many women feel left out, each October, during National Breast Cancer Awareness Month, knowing our stories will not be told. No one will hear of the stage IV women who had died that year, except perhaps, the rare celebrity, or as a matter of statistics. The stories will be of “survivors”, women diagnosed “early”, and “cured”. We will hear about famous women who fought the earliest stage cancers and SURVIVED. And the speakers at the walks will promote awareness, and prevention, and survivorship. I understand the need for this cheerfulness, and these stories of survivorship. I know how important, how necessary it is to be told that, especially in your case, there is hope for a cure. But, I am beyond that definition of hope. My hope is for clean scans, and new treatments that work so well, I am still alive to attend my daughters’ weddings and meet my grandchildren. I hope to put off as long as possible, leaving behind a husband, who is grieving the loss of his wife. My breast cancer is no longer just pink. It now, includes gray, the color of nothing – the nowhere land where I live, no longer a survivor, but a fighter, never giving in, never giving up. And, black, the color of death, for surely, one day, my fight will end. And the problem with “pink” is simply that, with all the awareness it generates, no one is aware of stage IV cancer, the cancer that kills. And no one is prepared to join this club, which is beyond pink, because it will not be spoken of, for yet another year. Laura Wells lives in Costa Mesa, CA, with her husband and two of her three daughters. She is writing a book about her experiences with metastatic disease and working to raise awareness of the unique needs of metastatic breast cancer patients. She blogs at http://www.Mystage4life.blogspot.com. October for Breast Cancer Awareness, were you aware that there is one day which is given for Stage IV Breast Cancer women and men-yes, only one day! Can you please change the lights on that day for us? Maybe Pink and Black or just Black because society has swept us under the rug-you see, less than 3% of Komen funds are given for Stage 4 Metastatic Breast Cancer, the rest is earmarked for awareness, prevention and “PINK” advocacy, but what about us? Please follow this link http://mbcn.org/developing-awareness/category/house-resolution-senate-resolution/#senate to the MBCN.org website. 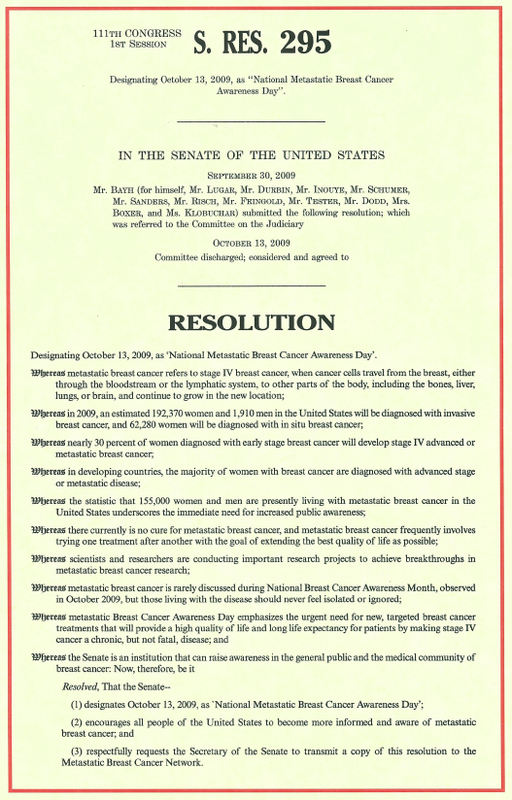 This is the Senate Resolution enacted in 2009, designating October 13, as National Metastatic Breast Cancer Awareness Day! Please take the time to support this as 40,000 women and men are dying each year with no cure in sight-no cure at least for the Stage 4 community. Theresa was not deterred and is now planning on being at City Hall on October 13, 14 and 15, camcorder in hand, discussing metastatic disease with passers-by and distributing MBCN pamphlets and copies of the 2009 Senate Resolution for October 13. “I’ll just tell everyone we’re so pushed into the shadows that we couldn’t even get recognition on our one day – October 13,” she quipped. When asked what she would advise others who want to follow her lead, Theresa said to start in your own community or state. Email your mayor, suggest changing the lighting if they use it or suggest passing a resolution to honor October 13 as Metastatic Breast Cancer Awareness Day. If the community has a program on breast cancer, ask to participate in it, and use your voice to educate people about metastatic disease. Email us at mbcn@mbcn.org and we can answer your questions and supply pamphlets, t shirts and information. For other suggestions see our MBCA advocacy kit. I read your column about featuring stories dealing with breast cancer in your newspapers during the upcoming breast cancer awareness month. As you noted most people know someone who has been affected by breast cancer. They certainly are already aware of breast cancer. One in eight women (and a not an insignificant number of men) will be diagnosed with breast cancer. 30% of that group at some point will have to deal with breast cancer that has metastasized. That is the real killer. Cancer in the breast is not lethal; it is when it works its way to other parts of the body (liver, brain, bones), that it becomes fatal. My wife, Judith, has lived with metastatic breast cancer since her initial diagnosis almost 8 years ago. She is being treated at Dana Farber, participating in a clinical trial for almost 7 years. She is fortunately a statistical outlier since life expectancy averages about two and a half years post metastatic diagnosis. She, like all those with metastatic disease, will be on one form of treatment or another for the rest of her life. There is no time free from treatment. There is no cure. In 2009 we worked with others in the metastatic breast cancer community to raise awareness about this dark corner of the larger breast cancer community. Working with members of congress we were able to have October 13 designated as National Metastatic Breast Cancer Awareness Day. I have attached a copy of the Resolution as passed by the United States Senate for your information and use. Many state and local governments (including here in Plymouth) passed similar resolutions. It is so important that this group of people dealing with metastatic disease not be isolated or ignored. Additional research funding and funding for treatment should be focused on the needs of this group. A lot has been done to raise awareness of breast cancer in the broadest sense. More needs to be done to deal with the deadly and fatal side of the disease. I would urge you to focus some of your efforts on raising awareness about metastatic breast cancer during the month of October. It is a job that needs doing. Thank you for focusing on the issue of breast cancer. Please take it a step further and deal with this critically important issue as well. Stage IV Ad from Komen – Is this a crack in the pink wall? This has to be the first time that Komen has publicly acknowledged Stage IV as part of their marketing campaign. Hopefully, Komen will have more ads about Stage IV in October. Organizations are slow to change and whether this is partly due to the Komen organizational shakeup or the Metastatic Roundtable Komen hosted last February to seek information from 10 metastatic breast cancer patients, it is a welcome, small step forward and one that many of us would never have anticipated. The ad, of course, is certainly not perfect, as it seems to imply that Bridget would not be surviving 7 years without her active, hopeful personality or her doctor’s ‘fighting’ for her. Does that mean that those who died sooner had the wrong medical team or the wrong personal attitude? Certainly not. What should be our reaction now? I think we should be open and supportive of the change at Komen. Contact your local Komen organization and let them know you are metastatic (or Stage IV) and appreciate the metastatic support cited in the ads and hope Komen will be increasing funds for research into the causes and process of metastasis. I know this will be particularly difficult for many of us who have deep feelings of estrangement and resentment toward Komen and the pink ribbon culture. But some within the Komen organization are trying to change things and that needs to be encouraged and supported. You are currently browsing the MBCNbuzz blog archives for September, 2012.